Punjab Grill’s private dining area. Photo courtesy of Punjab Grill. Punjab Grill has a presence in India, the United Arab Emirates, Singapore, and Thailand. And now, the fine dining Indian restaurant will have its first location in the US. The Penn Quarter restaurant opens today with an elaborately decorated dining room almost entirely built in India. Karan Singh, CEO of Punjab Grill US and owner of American Tandoor in Tysons Corner, built the restaurant as an extravagant love letter to the delicate craftsmanship and opulent details found in India’s palaces. To help with his mission, Singh hired Jaipur-based designer Ayush Kasliwal to infuse the space with royal touches. The Passage to India room is inspired by the railway cars of the past. Photo courtesy of Punjab Grill. 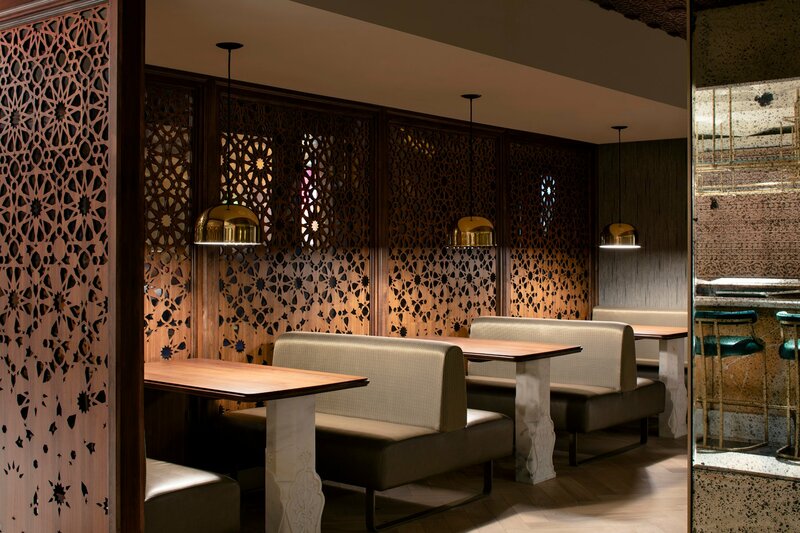 Detailed craftsmanship dispatched from India stretches across all four sections of the restaurant. The “Passage to India” room is outfitted in custom-carved wood paneling inspired by retro railway cars, while tables in the “Living Room” are inset with precious stones as an homage to an Indian ruler’s royal medallion. Behind the bar, a floral wall was hand-carved in India out of pink sandstone then shipped (along with the geometric ceiling) the restaurant. The bar’s white marble counter is inlaid with mother of pearl, constructed with the same technique as the Taj Mahal. The Sheesh Mahal, a private dining area, is laden with 150,000 mirrors. Photo courtesy of Punjab Grill. Of all the spaces, the crown jewel of Punjab Grill is the private dining room. Known as the Sheesh Mahal or the “palace of mirrors,” the room is named after a fort in northwest India. Singh says if you light a single candle in the palace, it will “reflect the whole night sky.” In the DC version, the light glows off 150,000 hand-laid mirrors. The dining room has its own concierge to tailor the experience to the individual guest. According to Singh, the concierge will arrange the details from custom menus to embroidered napkins and musical performances. Eggplant, heirloom tomatoes, and burrata pay tribute to Punjabi dairy farmers in Italy. Photo courtesy of Punjab Grill. Prior to opening his restaurants, Singh worked in the aviation industry, inspiring the internationally influenced Indian small plates he refers to as “Punjab takes over the world.” Dishes include a hummus made out of smashed chana masala chickpeas and Thai chicken infused with lemongrass butter chicken sauce and paired with lemon naan. 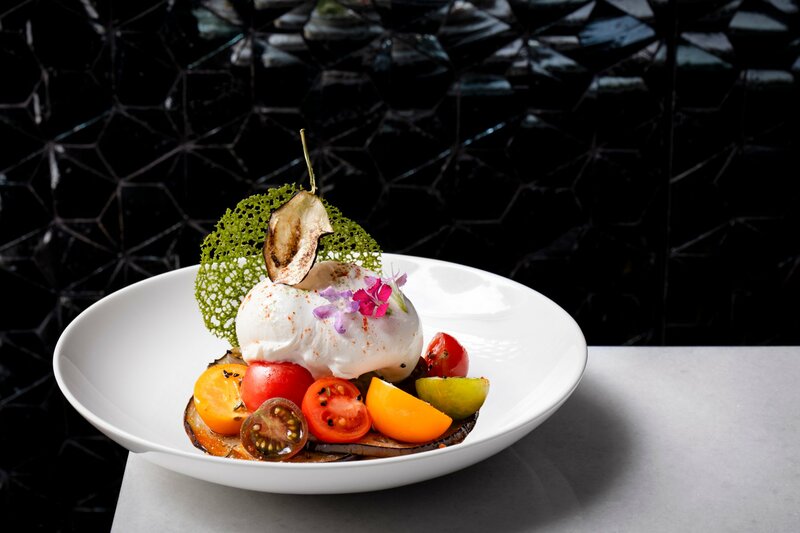 Perhaps most exemplary of the union between global ingredients and Indian flavors is the burrata, sprinkled with garam masala and surrounded by a halo of eggplants and heirloom cherry tomatoes. While the dish nods Italian, it is actually inspired by the Punjabi region’s fertile dairy industry. In the 1980s, Italy received a flood of dairy workers from Punjab who effectively saved the region’s cheese production industry. Other dishes take Indian street foods and elevate them to fine-dining. For example, gol gappa—fried crisps filled with spiced potato and chutney—is a messy snack that Singh enjoys when he returns home to Punjab. But chef Jaspratap Bindra upgrades the dish with spiced water poured into small passionfruit orb. The candy-like sphere is placed on top of the puff and when eaten in a single bite, bursts with the same refreshing sensation as the street food version. 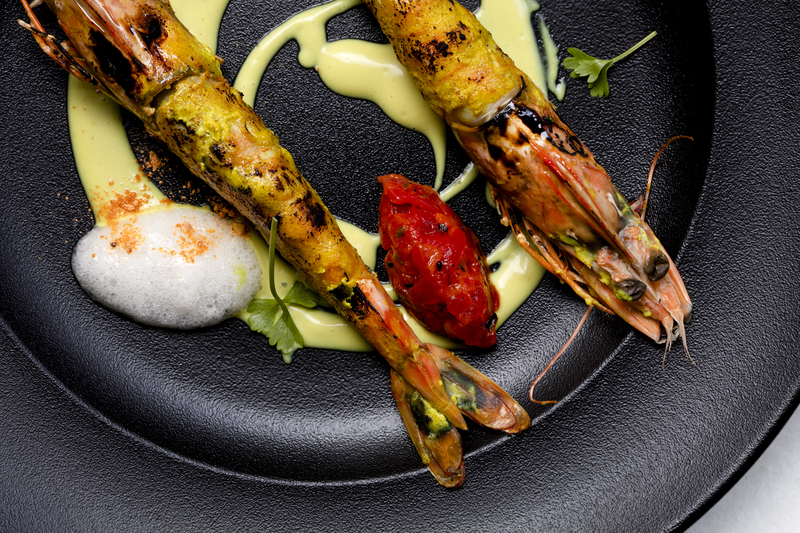 Tiger prawns are cooked in a tandoor. Photograph courtesy of Punjab Grill. Bindra’s menu also includes a lamb shank with mincemeat curry, tandoori tiger prawns paired with tomato jam, and creamy black lentil dal cooked for 24 hours. 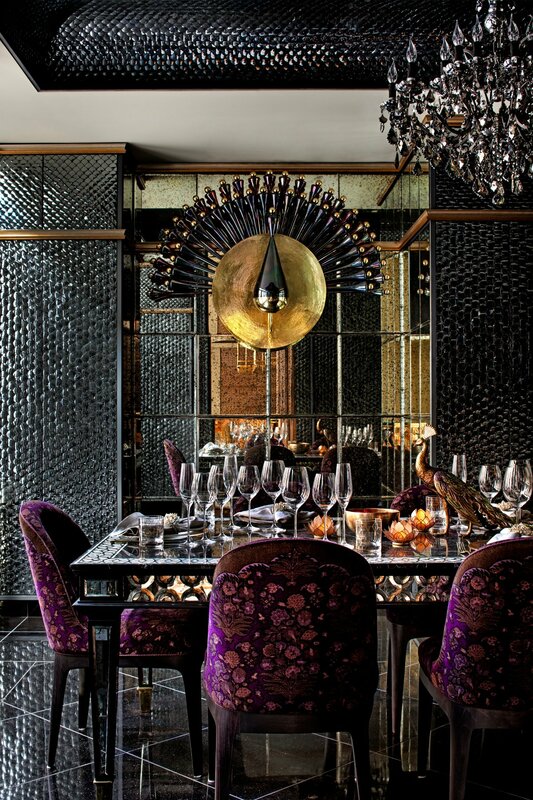 For a more elaborate experience, there is caviar service and the restaurant’s take on a Peking duck. Carved tableside, the dish swaps out the traditional hoisin, pancakes, and spring onions for roti, tamarind chutney, and house pickles. For dessert, cheesecake is made from paneer, often found in savory dishes and another ode to the dairy farmers of Punjab. 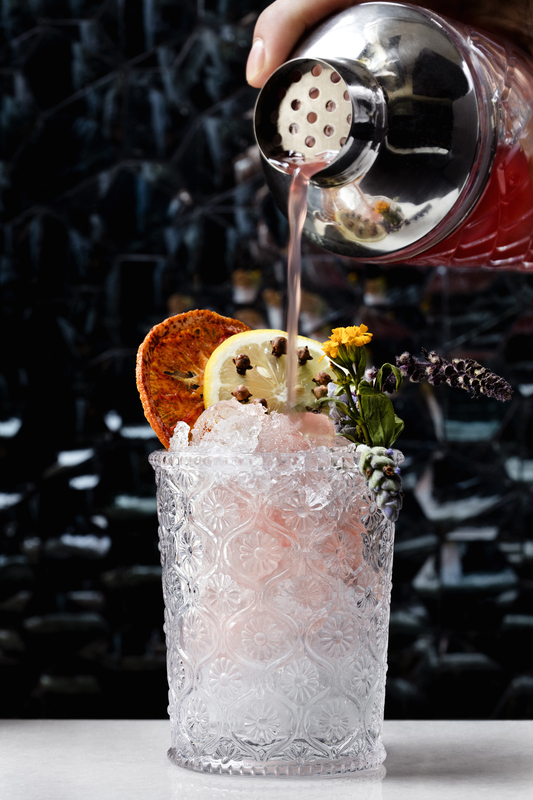 The cocktail menu also incorporates Indian flavors, like the “Land of Five Waters” punch with garam masala syrup, Calvados brandy, chamomile tincture, and Prosecco. The word punch and Punjab both come from panj, the Punjabi term for “five,” a direct nod to the region known as “the land of five waters.” In addition to the cocktail menu, the restaurant boasts a wine list of almost 300 bottles. The punch is called the “The Land of Five Waters,” another name for the Punjab region. Photo courtesy of Punjab Grill. While the District is already home to fine-dining Indian restaurant restaurants, such as Bombay Club and Rasika, Singh does not see his neighbors as rivals. Punjab Grill. 427 11th St., NW. 202-813-3004. Open Monday through Friday 11:30 AM to 2:30 PM for lunch, Monday to Thursday 5 PM to 10 PM for dinner, Friday to Saturday 5 PM to 11 PM for dinner, Sunday 5 PM to 9 PM for dinner.